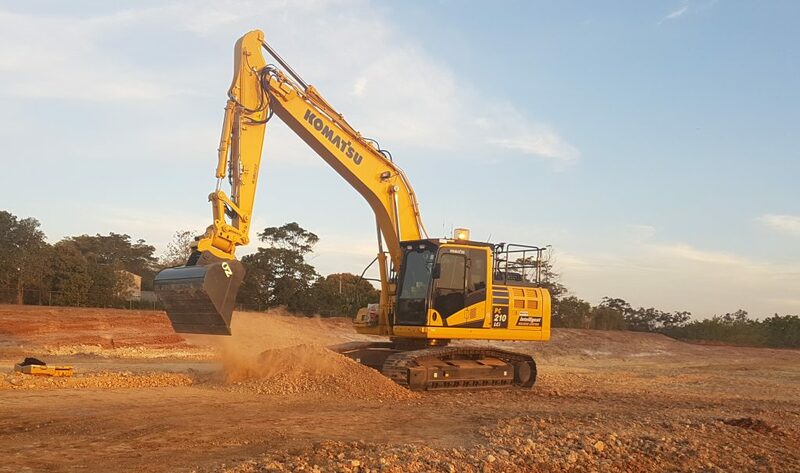 The first Queensland-purchased Komatsu excavator that can intelligently perform traditional manual operator duties has been hired out on a long-term roadworks project by Sunshine Coast-based civil earthmoving and construction company, Weier Group. Owner Gareth Weier’s business specialises in wet plant hire, supplying premium earthmoving and roadworks services to leading contractors and developers throughout South East Queensland. After working for eight years as a loader operator in an underground gold mine, Weier continued his passion for machinery by starting his earthmoving business with a single skidsteer. He has since built his fleet up significantly, using predominantly Komatsu excavators including a hybrid 335LC-1, a PC300LC-8, two PC138US-8, one PC45MR-3 and one PC88MR-8. His most recent purchase has been a Komatsu PC210LCi-10 iMC excavator, in line with the company’s progressive approach to new machine technologies. “I like to be on the cutting edge of technology in terms of our equipment in order to demonstrate the progressive nature of our business,” said Weier. “That’s always been our approach: something new comes out from Komatsu and we check it out to see if it can benefit our business. “I wanted to see what the intelligent excavator could do. I had a go on it and I found it was really good. Weier was particularly impressed by the Komatsu iMC excavator’s automatic control features, which offer real-time bucket edge positioning in relation to the machine and job surface. “With a normal machine the operator can see the level he has to dig to, but has to keep stopping to use his bucket to check digging depths and ensure they’re on grade. “With the iMC excavator you take the bucket down to the line, pull one lever and it automatically traces the ground so the operator doesn’t have to think and do as much as they would, conventionally, to avoid cutting past the line. “Once the design model has been loaded into the iMC machine, the surface level is set and the operator cannot cut past the level they have to dig. According to Komatsu NZ National Sales Manager Garth Dixon, the iMC excavator’s exclusive automatic control function technology can result in more than a 60 percent improvement in work efficiency when compared with conventional construction processes. “Since we introduced this technology in New Zealand some years back, Kiwi contractors have really taken advantage of it,” Dixon said. These advantages have also been appreciated by Gareth Weier. “It is obviously more accurate, and I saw that it would be quicker in practice,” he says. So, is this something he has already been able to leverage with his customers? “It’s early days so we don’t jump up and down about what it can do for a customer, but it does allow them to see the performance and benefits of the new machine in action on the job. “I think they will count the outcomes and that builds a case further down the line. Weier is also mindful of the benefits of iMC excavator’s exclusive automatic control function technology for his operators. “They don’t have to concentrate on cutting to a line as much when they know that the machine can take control and come down to the level,” he said. With Komatsu’s iMC technology integrated into the excavator, Weier says he wouldn’t consider ‘bolt-on’ alternatives. 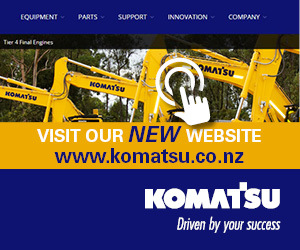 “The integrated Komatsu technology is not that much more expensive. It’s basically around the same cost but you’re dealing with Komatsu rather than a third party, which is our preference. “We have a machine from another manufacturer that is nightmare to deal with, in comparison. Getting anything done by them is like pulling teeth,” he says. “Komatsu, however, is always so easy to deal with. They are very reliable machines, but if anything needs attention Komatsu is right on fixing it. “That’s absolutely imperative in this industry because downtime equals losing money. We need machines that won’t let us or our customers down. From here on, Weier sees additional Komatsu iMC machines being added to his fleet. “Yes, this is our first step into that suite of the different offerings in Komatsu’s SMARTCONSTRUCTION offerings. “I’m focused on continuing to grow the business. “I know Komatsu has an iMC dozer so I will be keeping an eye on that. Hopefully a job will come up that suits it,” he says.